The clockis ticking down to NASA?s launch tonight of the official name for a new spacestation room, which the space agency will unveil on Comedy Central with thehelp of comedian Stephen Colbert. The namefor the module, currently known as Node 3, will be announced tonight at 11:30p.m. EDT (0330 April 15 GMT) on Colbert?s satirical television show ?TheColbert Report,? which the comedian used to urge his viewers - and later NASA -to namethe International Space Station room after himself. ? NASA held anon-binding online poll to name the new cylindrical room last month, allowing thepublic to either choose one of the agency?s suggested titles - Earthrise,Serenity, Legacy or Venture - or write in their own candidate monikers. Once Colbertlearned of the voting poll, he used his show to campaign for his own name,urging viewers to write in ?Colbert.? The result was staggering. Colbert?s fanscast morethan 230,000 votes for the comedian, outdistancing NASA?s top suggestionSerenity by 40,000 ballots. Tonight,NASA astronaut Sunita Williams - who lived aboard the station for nearly sevenmonths in 2006 and 2007 - will announce the final name for Node 3. But NASAchose to unveil the name on Colbert?s show because of the enthusiasm shown bythe comedian and his fans. ? NASAspokesperson John Yembrick told SPACE.com that Node 3?s name wasselected early last week, but was unknown to Colbert or his show?s producers. ?We tookthe name that we thought would best fit Node 3,? said Yembrick, who did notreveal the name to SPACE.com. In theweeks that followed the poll results, Colbertrepeatedly challenged NASA to stick to the popular vote, even though thespace agency clearly stated from the outset that it would have the final say onNode 3?s name. Some reports suggested NASA would meet the comedian?s fanshalfway by naming Node 3?s spacetoilet after Colbert. 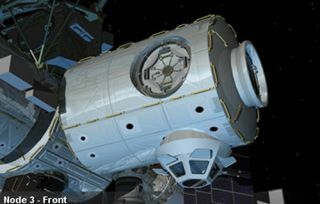 WhileWilliams will lift the curtain on Node 3?s final name, astronautsaboard the International Space Station and on Earth have said they areeager to see the new orbital room?s delivery no matter what it is ultimatelycalled. The module is set to be launched in February 2010 and house a spacetoilet, as well as eight refrigerator-sized equipment racks that will contain much ofthe outpost?s life support equipment. Last month,NASA astronaut Kay Hire told SPACE.com that she was excited by Colbert?sefforts to attach his name to Node 3, if only because it brought the agency?s spaceexploration efforts to an audience that may otherwise not have taken aninterest. Hire is oneof the astronauts who will deliver Node 3 to the space station. She said sheand her crewmates planned to vote in NASA?s naming poll and were eager to seeits results. ?It wouldneat if it was something kind of catchy again that got the attention of some folksthat maybe hadn?t paid attention previously,? Hire said. ? NASAwill unveil the new name for Node 3 tonight on the "The ColbertReport," which will air on Comedy Central at 11:30 p.m. EDT. Check locallistings.